England will play a Test match in Newcastle for the first time next year in preparation for the 2019 Rugby World Cup in Japan. The game against Italy will take place at St James' Park on 6 September. 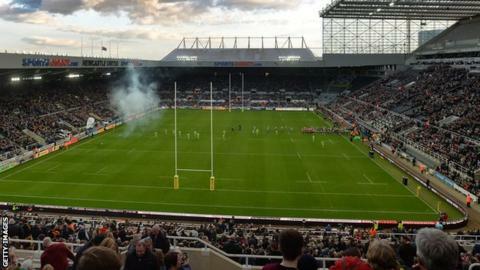 Newcastle United's ground was a host venue during the 2015 World Cup and will stage the 2018-19 European club rugby finals as a double-header. England also face Wales and Ireland at Twickenham in August next year and will take on Wales in Cardiff. "These internationals will be extremely important to the squad's final preparations before we head out to Japan," head coach Eddie Jones said. "It is great news to be able to take England to another part of the country and Newcastle will be fantastic hosts like they were for the matches here in 2015." The game will be England's first 'on the road' on home soil since their 2015 World Cup pool game against Uruguay at Manchester City's Etihad Stadium. Previous matches have been staged at Manchester United's Old Trafford stadium and Huddersfield's John Smith's Stadium.